Can Esports Actually Make it into the Mainstream? Esports is well on its way to becoming a household name. Almost 70% of internet users in the UK and U.S. alone have now heard of the term “esports”. As many as half of those aged 55-64 are also aware of these competitive video game tournaments. A significant chunk of this growth has been in the last year. This is making esports a more cohesive and accessible genre of entertainment among new audiences, and helping to win over potential investors and sponsors anxious for signs of strong revenue generating potential. Unlocking the next stage of esports growth. Our research identifies an important opportunity for even more eyeballs to come to esports in the next year, and on a global level. In each of our world regions, there’s a gap between the number of people watching gaming live streams (online video where internet users watch other people play games) versus those watching esports tournaments. Since internet users are already watching other people play video games, it’s only a small jump to watch competitive matches. 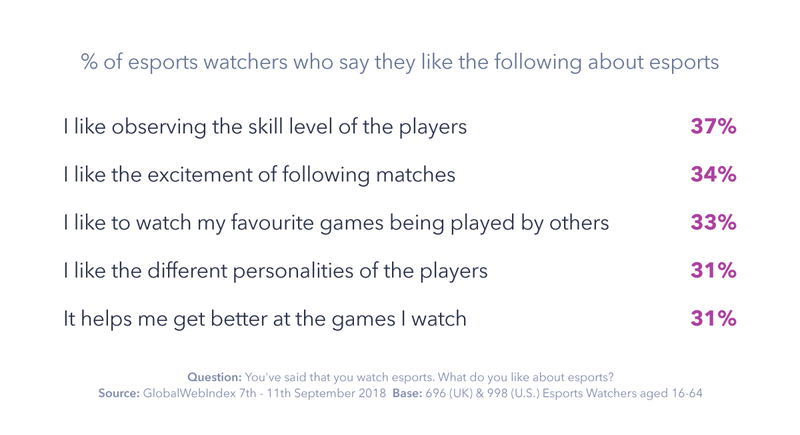 In a special survey conducted in the UK and U.S., we also identified those who had heard of esports but said they didn’t watch it, and asked them why they’re not choosing to engage. A third said that they hadn’t had the chance to explore it, so finding the right means to introduce them to esports will be crucial in onboarding the currently curious. 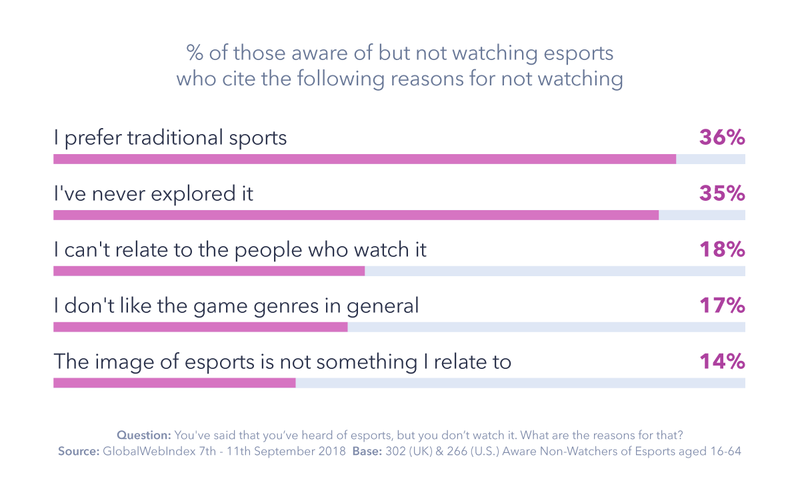 The biggest reason for not watching esports was because respondents preferred “traditional” sports (36%). This underlines one of the bigger challenges in advertising esports to a wider audience; some potential viewers still need to be convinced of the skill involved in playing it. But this isn’t necessarily an insurmountable challenge. Within this survey, we also asked current esports watchers what they most enjoyed about following it. The top answers were “observing the skill level of the players” (37%) and “the excitement of following matches” (34%) – both factors closely aligned with “traditional” sports. Reasons more specific to esports or gaming such as “being able to comment in real-time” (23%) were further down the list. So while there may always be some holdouts who will never see esports on the same lines as traditional sports, pitching it with many of the same strengths and qualities associated with “traditional” athletes might break down some of this resistance. Esports and traditional sports are not polar opposites. Despite many traditional sports fans remaining unconvinced of esports’ close relationship with their favorite sports leagues, plenty of the sports leagues themselves have been keen to capitalize on this relationship. It’s this increasing involvement from traditional sports organizations which will be a key impetus in the growth of esports in 2019. Traditional sports have been involved in the esports scene since before the franchising movement in esports started to bring its league structures and revenue models closer to its traditional cousin. Sports fans are more than 40% ahead of average for watching esports tournaments each month, at 23%. Engaging the next generation of sports fans is a key priority in the traditional sports industry, which has been relatively slower than other categories in migrating to digital. For many sports leagues, esports represents an important means of reaching younger fans and unlocking more revenue. The gaming industry boasts a growing annual valuation far above even the film and music industries, providing a strong incentive for a new wave of sports leagues to join the fray. A good example of this is the National Hockey League (NHL) in the U.S., which has announced its 2019 plans of moving much further into the esports scene, involving all of its clubs in harnessing esports to increase interest in the the NHL itself. This isn’t the only competition driving viewer growth, either. Publishers like Activision Blizzard and Epic Games are investing in licensed leagues of their games to generate the most return from their franchises. This competition among stakeholders around the industry should help drive investment as they race to secure eyeballs and advertising dollars. 2019 will also see esports continue to make waves on traditional TV. Esports made its first bow onto an ESPN primetime slot in 2018, and it was able to piggyback on competitions with a pre-existing broadcast profile as it debuted at the Asian Games as an exhibition event. As we saw earlier, one of the top reasons why internet users don’t watch esports is that they haven’t had the chance to explore it. With more broadcast channels at their disposal, this should become less of an obstacle. Could esports pioneer new monetization models? The esports audience is largely considered a hard-to-reach demographic using conventional marketing campaigns, and it’s this audience which remains the prize. Esports viewers are mostly young, tech-savvy males with considerable spending power. With such a desirable demographic, stakeholders in esports are keen to discover new and innovative ways of monetizing them. Currently, advertising and sponsorship deals form the backbone of esports’ revenue generating capabilities, but our research reveals that the majority of those currently watching esports would be prepared to pay to watch their favorite esports leagues. A third of esports fans said they would pay if it was subscription-based, and just under a fifth said they would pay if they could purchase access to individual matches. Being such a young, agile and, above all, digitally interactive genre of entertainment, esports could emerge as a pioneer for monetization models if it’s successful in creatively generating value from its fanbase. Microtransactions have long been a part of the fabric of esports games, allowing players to personalize their avatars with “skins” and viewers to reward their favorite players while watching them compete. This element of interactivity holds appeal among esports fans, who throughout our global research display unique expectations from brands. 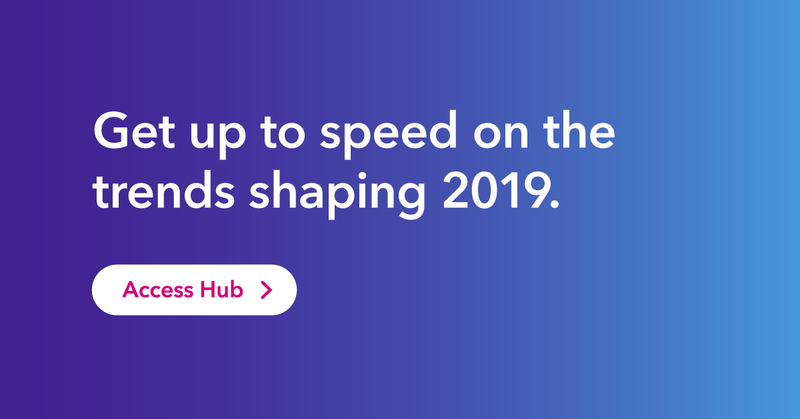 These expectations are centered around personalization, involvement with the brand and its products, and a desire to connect with other fans. Esports also benefits from a strong suitability to new experience-based technologies spearheading their way into the entertainment scene, like virtual reality (VR) and augmented reality (AR). This gives the sport more monetization opportunities as it looks to provide new and unforgettable experiences. Will future developments in esports be well received? As these monetization models become more innovative and sophisticated, esports will look to acquire a greater profile on TV and in real-world stadiums, and enter into more lucrative sponsorships and partnerships with larger brands. But are these changes that its viewers will welcome? After all, the gaming community is notoriously vocal about any controversial changes, particularly those regarding revenue models. 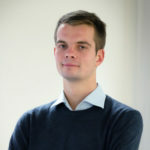 This, together with esports fans’ higher likelihood of using ad-blockers to avoid advertising not aligned with their interests, has led to a degree of caution in regards to commercializing the genre. Originally, winnings in esports tournaments were provided by a group of what are often called “endemic” sponsors – businesses directly involved with the equipment and gear around gaming, usually manufacturers of hardware and accessories. Categories like energy drinks have been associated with esports for a while, with Red Bull making its first steps into the industry in 2008, but these should be considered as near- or semi-endemic brands, still fairly close to the nuts and bolts of esports. One of the pivotal changes on the horizon will be when more completely non-endemic brands come on board for advertising or sponsorship. When we asked esports fans in the UK and U.S. whether they are receptive to the entry of these brands into sponsorship or advertising deals, almost 60% replied favorably. We also saw similarly positive attitudes towards a number of ongoing developments in the industry, such as franchising leagues and enabling gambling on esports events. 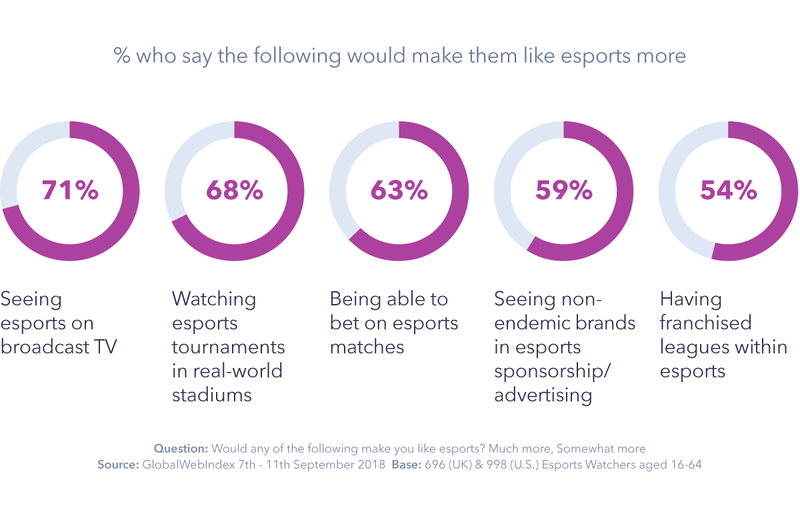 Above all, however, esports fans were most enthusiastic about the prospect of seeing esports leagues on broadcast TV (71%) or in real-world stadiums near them (68%). Only around 1 in 10 esports fans in the UK and U.S. said any of these developments would take away from their enjoyment of the entertainment. These developments promise to inject more money into esports leagues and spur further growth. They also promise to allay would-be investors’ concerns over the potential of esports to diversify away from its reliance on sponsorship and advertising. But this doesn’t take away from the fact that the esports community is both diverse and relatively tight-knit, held together by interests and knowledge of particular gaming titles. Esports may be on the brink of large scale commercialization, but putting this sense of community front and center will be key for stakeholders in the industry, especially as its growth is swept along by the interests of Amazon and traditional sports leagues in the year ahead. Small Agencies are Getting Smarter with Data. Here’s How.